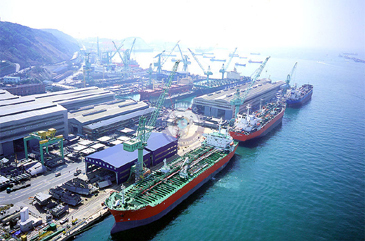 The Dubai-based Gulf Energy Maritime (GEM) on Jan. 17, 2006 signed a US$ 180 million contract with South Korea's Hyundai Mipo Dockyard for building four high specification double hulled product/chemical tankers. The four tankers, with 47,000 tons capacity each, are scheduled for delivery in 2008 and 2009 and will be named Gulf Baynunah, Gulf Jumeirah, Gulf Muttrah and Gulf Rastaq. Speaking at the signing ceremony, GEM CEO Yusr Sultan said: "This contract reflects the continued expansion of GEM and its extensive servicing of regional and international customers. These tankers, which will carry easy chemicals, will be state-of-the-art. They will be fitted with the latest deep well pumps, nitrogen generators and meet international environment safety requirements of being completely double-hulled." "Hyundai Mipo Dockyard Co. was selected following extensive consultations with a number of shipbuilders. We had to ensure that we build at a yard with long track record of building similar ships and on the right commercial terms," added Sultan.